GRAMMY Award-winner Zakk Wylde’s legendary career includes a lengthy tenure with Ozzy Osbourne in which Wylde co-wrote and recorded several albums, including the multiplatinum No More Tears, Osbourne’s largest selling solo album featuring the classic hit single, ͞Mama, I’m Coming Home͟ and the bulk of the double platinum 2002 set, Ozzmosis. With Osbourne, Wylde has played on countless world tours and television appearances, with his signature bullseye Les Paul in tow. Wylde has his mitts imprinted on Hollywood’s Rock Walk of Fame; guest-starred alongside Mark Wahlberg and Jennifer Aniston in the movie ͞Rockstar͟; and even momentarily joined Axl, Slash and Duff in Guns N’ Roses. But nothing offers the pure expression of Zakk Wylde’s animalistic ͞id͟ like Black Label Society, the stomping, heavy, bluesy, recklessly unhinged hard-rock-metal quartet who are quick to rip up a solo as to dip into a piano-fueled anthemic ballad. For more info, visit: www.zakkwylde.com. When Yngwie J. Malmsteen hit the scene in the early 80s, he turned the entire guitar world upside down. Never before was guitar playing like his ever heard. Drawing inspiration from his love for Baroque and Romantic classical music, Malmsteen employs classical violin techniques such as four and five octave arpeggios, pedal notes, and harmonic minor, diminished and Phrygian scales, flawlessly delivered at mind-boggling levels of speed and clarity. In doing so, he has singlehandedly created a brand-new style of guitar playing and composing that is still derived from today. In addition to having written and produced 35+ neoclassical rock albums, Malmsteen composed and orchestrated the "Concerto Suite for Electric Guitar and Orchestra,͟which he recorded with the prestigious Czech Philharmonic in Prague, conducted by Yoel Levy of Atlanta Symphony fame. Malmsteen subsequently performed the piece live with the New Japan Philharmonic and the Taipei Symphony, among others. Malmsteen has received numerous Grammy nominations, hundreds of magazine covers, dozens of Reader's Poll and Composer of the Year Awards, a plaque on the Rock Walk of Fame, signature model guitars, amps, pickups, strings, picks, pedals, microphones, and more. TIME Magazine placed him as one of the top ten guitarists of all time. Some 35 years and 25 million+ album sales later, Yngwie shows no signs of slowing down. For more info, visit: www.yngwiemalmsteen.com. Guitar virtuoso, singer-songwriter, and record producer, Nuno Bettencourt rose to international prominence as a guitar player with the GRAMMY-nominated, Boston-area band EXTREME, one of the most successful rock acts of the early to mid-1990s selling over 10 million records worldwide. Musically, EXTREME is dominated by Bettencourt’s blistering guitar riffs, often with funky, syncopated timing, and incendiary, high-speed rock/metal solos. Bettencourt penned the acoustic ballad ͞More Than Words͟ that went to #1 on the Billboard charts and ͞Hole Hearted͟that reached #4. He has released multiple solo albums as well as with bands he founded including Mourning Widows Population 1, Dramagods and Satellite Party. Bettencourt has written, produced and performed with many legendary artists including Rihanna, Steven Tyler, Paul McCartney, Janet Jackson and many others. 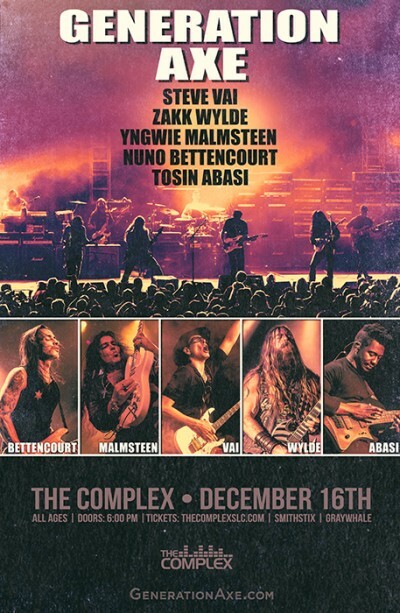 For more info: www.nunobettencourt.com.